Did you know QC-CALC is 21 CFR Part 11 compliant? QC-CALC even goes beyond the requirements with digital and electronic signature support! Announcing Two New Additions to the Product Lineup! We have recently added two new products to our list; the Enterprise Data Loader and the Enterprise Report Scheduler. The addition of these two products effectively rounds out the overall offering providing solutions to both small and large companies. These products are detailed further below. The primary goal of this new application is to completely synchronize the QCC files created by QC-CALC with a fully normalized SQL Server database. This way, when you change or add data to your QCC files via inspection or other editing, all of your changes are automatically moved to a SQL Server database without any work. 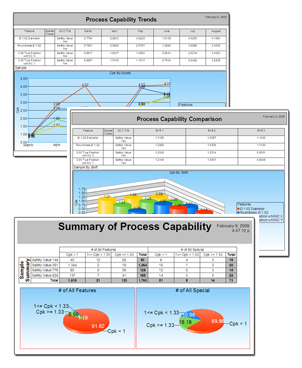 The Enterprise Report Scheduler provides high-level summary reporting at the factory or corporate level. Reports can be scheduled at regular intervals to compare the quality capability across departments, plants, and multiple locations. As we have added new products it is important to understand that our core offering is just as simple as it ever was. These new products are simply in addition to our current products and work with them to give you more options. We are often asked how to combine the data from multiple features that have the same nominals and tolerances. For instance, if you were drilling several holes with the same specs, you may want to group or stack the data to find out your repeatability for drilling this type of hole. This feature has actually been in QC-CALC SPC for many years, but many customers never knew it existed. As such, let's take a quick look at how to do it. In our example below, we'll run an XBar & Range report, but it will work with any of the reports in SPC. In QC-CALC SPC, go to Report > XBar and Range. 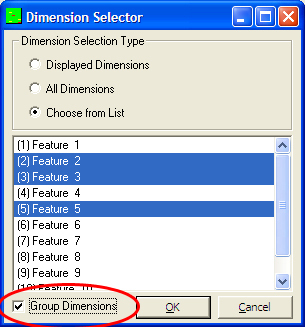 In the Dimension Selector, choose the dimensions you want to group (stack) and check the Group Dimensions checkbox. When you run the report, there will be only one chart with the data from all your dimensions grouped.